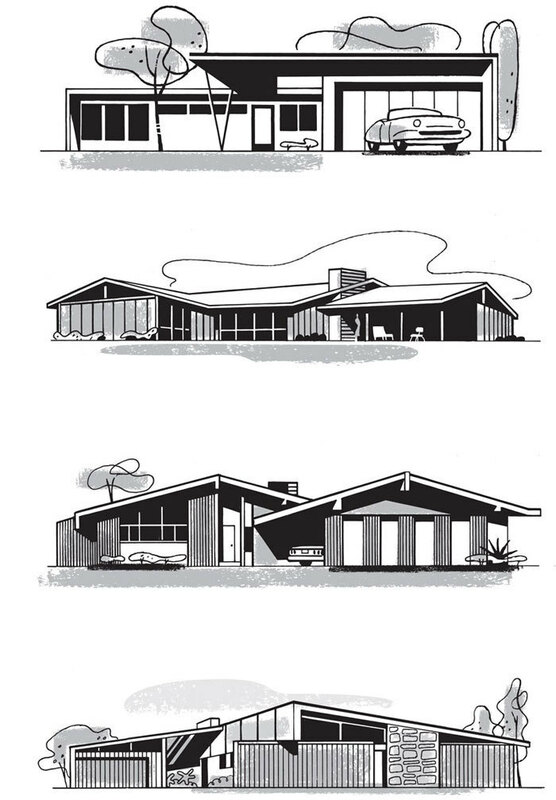 Los Angeles Magazine called for some spot drawings to accompany an article on the last fifty years of LA residential architecture. Since these were to appear about one inch across on the page, I treated them like the tiny ads in the back of mid-century architectural magazines. On some assignments, style and concept are the same thing. Mini masterpieces. Love the cars and the foliage. You know I love these. Beautiful and wish it was my assignment!! The Formica counters,the Angel Stone fireplace,the Mustang Convertable in the drive, the smell of fresh cut grass, and American Bandstand on the tube. Great memories in great little houses. Looks great, Paul. Spot on. After saving your African-American music poster since '92 along with some directory tear sheets depicting Tom Waits, Quincy Jones, Louis Armstrong, etc.--I thought I already had samples of the good stuff. Now... Damn: smaller, deceptively simpler, grayscale--just wonderful, particularly the top four, just brilliant. Love the sponge effect mid-tone. Kudos. Wow, Paul...these are absolute gems! You sure know how to do it, these are great. these are tasty as hell. I'll take the first one. These are fantastic Paul! I was away on a brief trip, so am late responding to these very crafted pieces. It's kinda' scary how you channel the look so effectively. I swear there must be a time portal that you reached into for these. Classic, but better. What issue of LA magazine are these in? They're in the October issue, on stands now. Found you via Twitter. Great stuff! I have a collection of Better Homes & Gardens from the 40's, 50's and 60's and your work is spot on! Forever Young is in a bookstore near you.